Tiki time again! 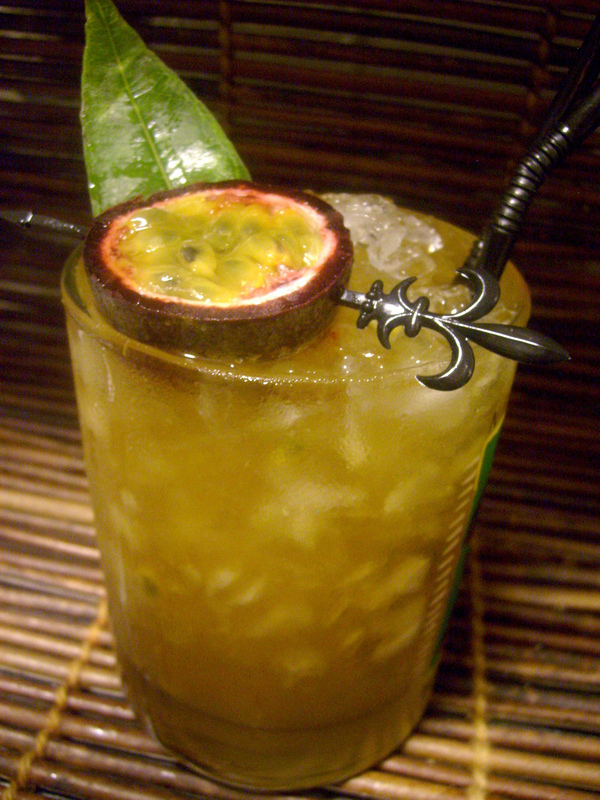 and here we are, tiki cocktail number six – which is the Blackbeard`s Ghost. It`s a Beachbum Berry original – a version of the Pirate`s Grog from Blackbeard`s Galley restaurant from cirka 1970`s which according to the description was a “feisty theme restaurant with decor to match its name.” There isn`t much more info to get on this drink, at least i didn´t find any. Mix in cocktail shaker with a glass-full of crushed ice. Then pour everything back into glass. Real sweet and sour – not the chemical mix – is the way to go as far as sweet and sour is concerned – at least to me. At first i thought 2 oz would be too much but it isn`t and falernum is just the right thing to balance everything togehter in this drink. 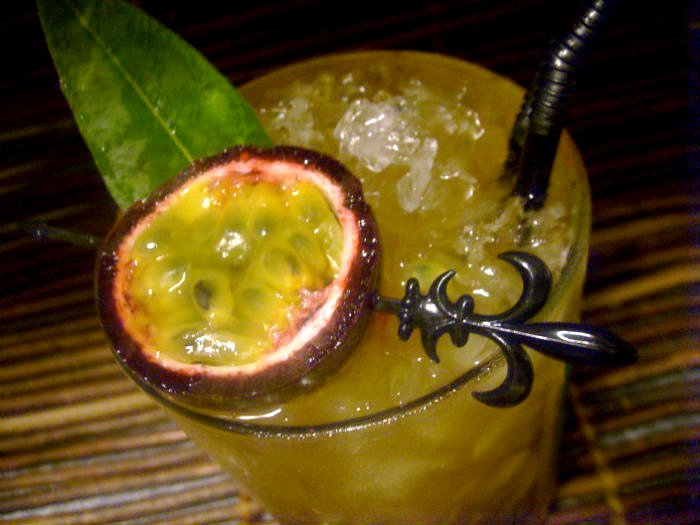 I like this one, its goes down easily – its fruity, sweet, sour, and lightly rummy with a pinch of spice from the angostura bitters. I`m not dissappointed. I used hm..not a Puerto Rican white here but El Dorado 3 year old cask aged white, quite a different rum. Let`s stay in the company of rummy ghostly tiki cocktails for a while – my twist of this is another and very different ghost – where the apricot brandy is switched for the subtle caressing of sweet vanilla, the angostura bitters for the more dark and spicy chocolately Mole bitters – to pair with the vanilla which is a natural companion to chocolate. This one of course tastes differently yet there´s some similarity, but here the demerara takes a step to the front lightly backed up by the xocolatl mole bitters and the sweet vanilla is lingering around binding it all together. Of course the choice of rums is the main thing to consider in this kind of drinks and playing around with different rums may bring out some surprises for the better or worse (hopefully the better). For dark demerara i used OVD (Old Vatted Demerara) El Dorado 12 or equal parts 12 and 15 i believe would be very good too. I like this one too… I actually like them both – so go ahead and try and let me know what you think. As a real vanilla geek i was happy to receive this vanilla liqueur – now i got a perfect excuse to indulge myself and everybody in vanilla flavored cocktails..
Navan is made by Grand Marnier and is made with natural ingredients and as we know vanilla isn`t the cheapest spice. The quality of Navan is good and the bottle is handsdown gorgeous, the flavour is very embracing, warm and aromatic. Sweet yes but still less sweet than you may expect due to its cognac base. Picture an exotic climbing vanilla orchid in bloom embracing you..then sending you whiffs of aromatic sweet vanilla fragrance – that´s its nose, until you dip your nose deep into the bottle, then the cognac heaviness takes over but with a sweet overtone. The vanilla beans used to make this product is the bourbon vanilla beans from Madagascar. The process in pollinating and curing vanilla is a long complicated and burdensome affair and thus the price is high. The vanilla orchid flowers does only bloom for a few hours in the morning once a year and thus needs to be hand-pollinted very quickly. After the green beans has grown ready to be picked they need to be treated for several months in order to become the fragrant oily dark brown vanilla pods as we know them from the shops. The aroma of vanilla is pure pleasure..its warm, fragrant and embraces you with its lingering scent and the flavour is sweet and aromatic. 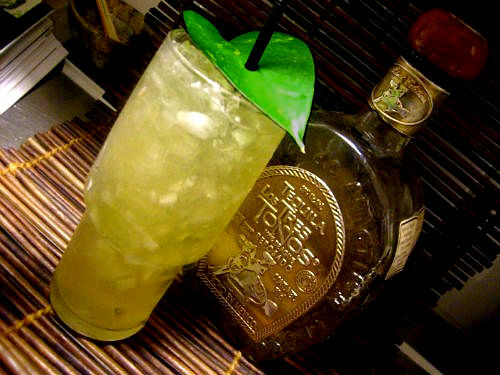 Its well known that a bit of vanilla liqueur serves very well as component that ties things together in many cocktails and especially in Tiki drinks. In the year of 1827 the first liqueur was created for the house of Grand Marnier and at a time when were expensive and hard to find. Now some 200 years later this cognac based liqueur is made with vanilla. Its not brand-new, its been here for a while but its the first time i get a chance to try it. There´s a village on the northeast coast of Madagascar called Navana and the name comes from it and its also from here the beans in the liqueur is from. The beans are shipped to France and then they are macerated in neutral spirit for a few weeks to extract all the flavour. After that the vanilla beans are combined with aged French cognac using the same procedure as is used in the creation of Grand Marnier. This is a nice vanilla liqueur and if you like vanilla then i recommend you try to get your hands on a bottle of Navan. Shake over ice, (not the Club Soda) strain into a glass with ice, top with a little Club Soda. Garnish with vanilla bean. Shake everything except grenadine over ice and strain into an old fashioned glass filled with cracked ice. Add grenadine and more ice to fill. Garnish with 2 vanilla beans. Mix things together in a shaker with ice, strain into a glass with crushed ice and garnish with a cinnamon stick and vanilla bean.